Whitney Font Features: Numerics | Hoefler & Co.
With numbers for text, titles, and tables, as well as fractions, symbols, and indices, Whitney contains more kinds of numbers than any other font in our library. Lining figures, standard in all editions of Whitney, are designed around the shapes of the uppercase. While lining figures are always recommended when setting in all caps, Whitney’s lining figures have been designed to a proportion that makes them attractive and useful in upper- and lowercase setting as well — especially useful in newsier contexts where old-style figures might seem quaint. Old-style figures, also known as “ranging figures” or “non-lining figures,” are numbers whose shapes are designed to harmonize with the proportions and rhythm of the lowercase. Old-style figures, intended for use in upper- and lowercase text, are essential when accompanying small caps; they’re especially useful for postal codes which contain both letters and numbers. 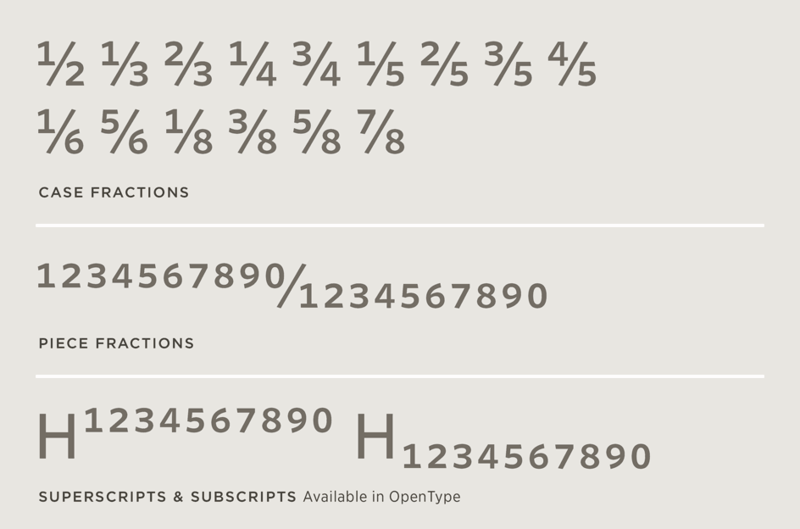 Whitney’s Advanced and Pro editions include old-style figures in all twelve weights. 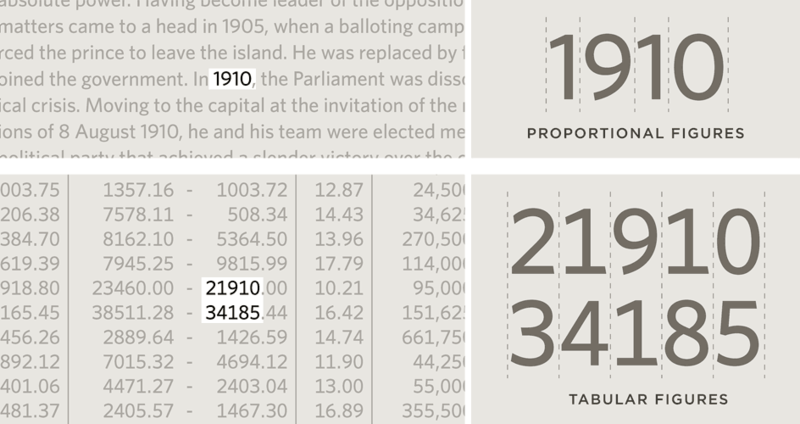 Whitney’s tabular figures maintain the same character widths throughout the complete range of weights and styles, an essential feature for when boldface is used to highlight an entire line (as is common in stock listings and sports statistics.) In each of Whitney’s styles, the fractions, monetary symbols, and mathematical operators are built on matching widths, so that a price expressed in dollars won’t affect the grid when the currency is recalculated in Euros. Each of the Numeric fonts includes readymade “case fractions” in denominations of halves, thirds, fourths, fifths, sixths, and eighths. Also included is a full set of numerators and denominators, all properly kerned to the fraction bar, for creating custom fractions. OpenType versions of Whitney also include superscripts and subscripts, useful for both footnotes and scientific formulae. In addition to the standard monetary symbols included in all Hoefler & Co. fonts (dollar, Euro, pounds sterling, yen, guilders, and cents) the Whitney Numeric fonts include an additional eight symbols for the Baht, Colon, Naira, Peso, Rupee, Rupiah, Won, and Sheqel. All Cyrillic editions of Whitney include the Hryvnia, the Ukrainian national currency symbol. Included alongside the small caps is a parallel set of punctuation — parentheses, brackets, braces, monetary symbols and commercial marks — designed to match the height of the small caps and old-style figures.